I enjoyed this fitting tribute to Capt. Sullenberger by my favorite literary troubadour Garrison Keillor, (Prairie Home Companion). 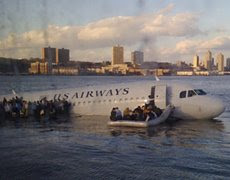 Sullenberger as we all know by know skillfully maneuvered a US Air Airbus to a safe water landing in the Hudson River after both engines died last week. How could a flock of birds so quickly destroy both engines? Why haven't they come up with some neat gadget to fit over the engines that would keep said birds out? The answer remains a mystery for now. But for those who have witnessed 9/11 in New York, thank goodness this story had a happy ending. Note: I wrote a song in tribute to John Lennon the night he died. I am now inspired to resurrect it. So he said to his copilot Jeffrey Skiles. Bring the landing gear up, extend the flaps." Donna Dent, Sheila Dail, and Doreen Welsh. With officers like Jeffrey Skiles. Donna Dent, Doreen Welsh, and Sheila Dail.